No insurance? No problem! A U.S. entrepreneur takes tourists down deep. Karl Stanley built the Idabel himself at a cost of $200,000. A U.S. entrepreneur takes tropical tourists down deep - in an uninsured submarine he built himself. Photographs by Chris M. Rogers. ROTAN, HONDURAS (Fortune Small Business) -- Karl Stanley is a very happy man: he just found a dead horse. 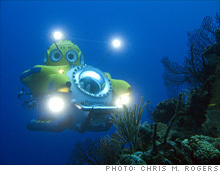 The entrepreneur made the discovery while cruising in his submarine, the Idabel, 1,700 feet beneath the waters off Roatan, Honduras. At that depth, amid jagged black boulders and hills of sediment, you can see some amazing creatures: lobsters with spindly arms as long as their bodies, silver-skinned fish the size of a cavalry saber, orange anglerfish with jaws locked in a perpetual grin. But to see the really big beasts, you need some really big bait. So eight hours earlier, Stanley had bought a tired old horse from a nearby stable, led it onto a boat, shot it in the head, tied cinder blocks to its hooves, and dumped it in the ocean. The sea this morning was rough, and an unexpected lurch tossed the carcass overboard before Stanley had reached his intended spot. In these murky depths, finding lost objects - even one as large as a horse - can be tough. But there it is, the body stiff but intact, and a foot-long, clawless crustacean called an isopod crawling up its flank. Then the main attraction glides slowly, sinuously into view: Hexanchus griseus, a deep-dwelling, six-gilled shark rarely seen by human beings. At 14 feet, it is slightly longer than Stanley's vessel. Watching it through an acrylic dome window, on which the water is pressing with the weight of a locomotive, I find it hard to decide which I should be more concerned about: the dead horse, the giant shark, or the fact that Stanley built this submarine himself. Taking your customers this far down in an uninsured, homemade vessel may not seem like the smartest idea for a small business. But that is exactly what Stanley, 34, has been doing in Honduras for the past decade, taking advantage of a light regulatory environment to go deeper than any other tourist sub in the world. Despite the disapproval of U.S. operators, a string of accidents, and a business model that barely keeps his head above water, Stanley remains stubbornly optimistic. One of his favorite T-shirts reads: DON'T WORRY, I DO THIS ALL THE TIME. Stanley can trace his obsession back to the age of 9, when he read a children's book about a team of preteen detectives who build a submarine to help solve an underwater mystery. He started sketching plans for a craft of his own, and by 15 he had started construction in his parents' backyard in Ridgewood, N.J. Stanley took the project with him to college in Florida, where he studied English literature (he has no formal training in engineering). The craft, dubbed C-BUG, took its maiden voyage the week he graduated. A lot of would-be Captain Nemos start putting together subs in their backyards. Few ever get them in the water. The number who then turn them into a profitable business is minuscule. But Stanley persevered. Once he had proved the C-BUG could withstand dives of 70 feet, he trailered it to Fort Lauderdale and dove progressively deeper and deeper. He got tows out to the ocean from local yachtsmen by offering them rides in the sub. In 1998, having gone down nearly 700 feet, Stanley felt ready to turn his sub into a business. What kind of business? He had no idea. So he signed up as an exhibitor at a local scuba-diving convention and sat alongside the C-BUG with a sign explaining that he was looking for ideas on how to use it. One of the first attendees to bite was the owner of a resort on the sleepy island of Roatan, 30 miles north of mainland Honduras, who thought that the prospect of a sub ride might draw new customers to his hotel. Stanley flew down and was instantly smitten with the location. "You've got the protection of the reef in case you need to ride out a storm, yet you can motor ten minutes offshore and be in deep water," he says. The C-BUG's next dive was on Roatan, and this time Stanley had a paying passenger. At the age of 24, he had entered the ranks of professional submariners. It has hardly been a risk-free enterprise. On one dive a window cracked 600 feet down, spraying seawater on a passenger. "That scared the crap out of me," he admits. (He has broken three more windows since.) At other times the C-BUG has gotten stuck in a cave, been tangled in lobster traps, and suffered small onboard fires. "I've never thought that I wasn't coming up," he says.